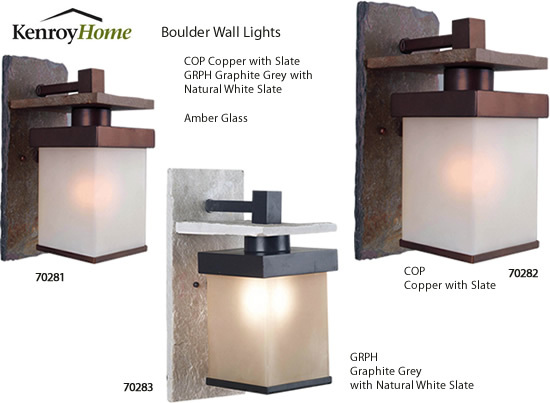 Natural slate backplate in earth tones with Copper finish or natural white slate backplate with Graphite Grey finish, accented with a light amber glass diffuser. 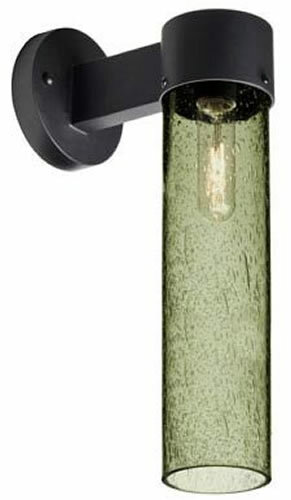 The sturdy medium base socket is rated up to 100 watts incandescent. 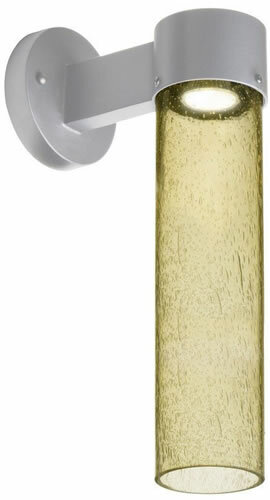 The diffuser will hide even an unattractive screw in fluorescent, so you can use any medium base light bulb. Dimmable with compatible dimmers and bulbs, sold separately. 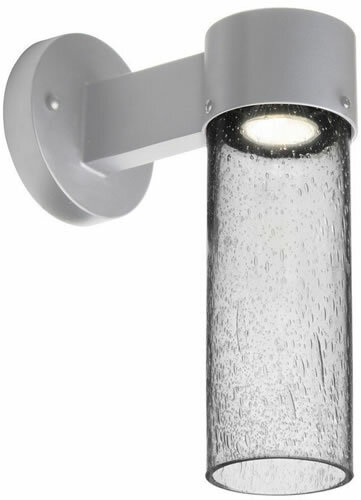 Can be installed with the light pointed up or down. 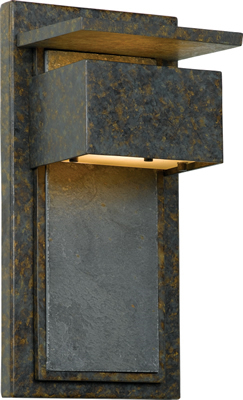 These contemporary outdoor wall lights feature a bronze framed panel of genuine slate with a two side lights. The slate panel is lit on each side to highlight the texture. 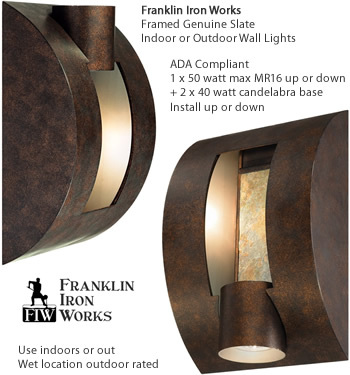 A halogen downlight adds functional convenience by lighting your path. 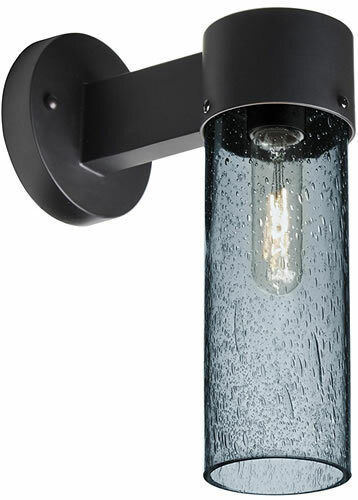 Can be mounted both indoors and out. ADA compliant. 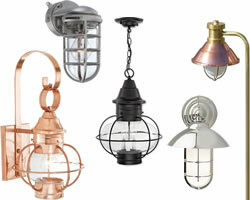 Beautiful designs inspired by the tradition of hand-crafted iron-working and the golden age of industrial design. 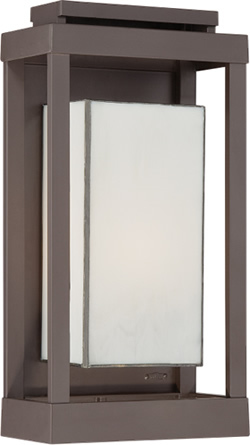 Height 14" x Width 7" x Extension: 6"
Height 18.5" x Width 9" x Extension: 7.5"
Enhance the exterior of your home with this unique contemporary design. It features a richly mottled backplate with a slate accent. Slate is a fine-grained natural stone that was formed on ancient sea beds over millions of years. It is a stately and durable stone that will leave a lasting impression. Because slate is a natural stone, no two pieces are identical. 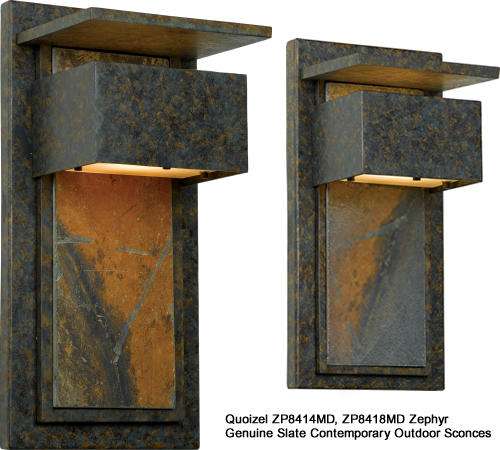 Indoor/Outdoor wall-mounted art-glass sconce in silver or Bronze finish with handcrafted, polished block of Crystal Shards or River Stones. 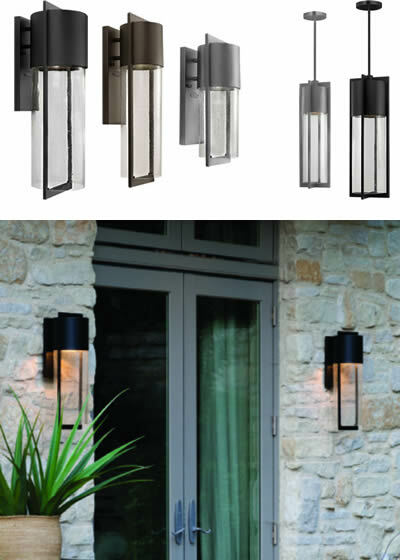 H 30" x W 7" x D 4"
Contemporary outdoor lighting collection made from solid aluminum. Available in 100w Medium base, 18w GU24 or 15w LED. 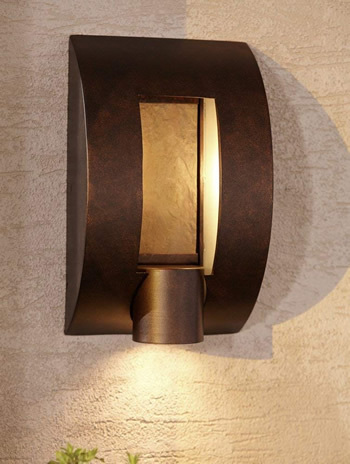 Wall-mounted sconces featuring handcrafted glass. 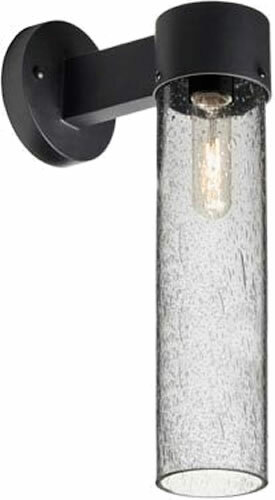 Cast Aluminum bracket powdered-coated in Black, Silver or White finish. 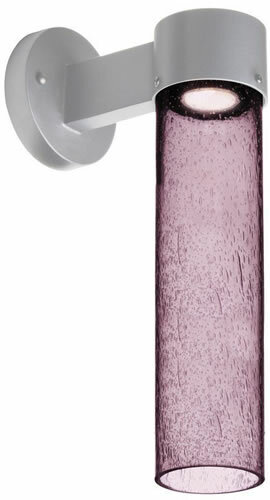 Glass secured by set screws. Installs directly to a 4” octagonal outlet box. May be used in either upward or downward orientation in indoor applications, downward only for outdoor. 75°C supply wire required for incandescent lamping. 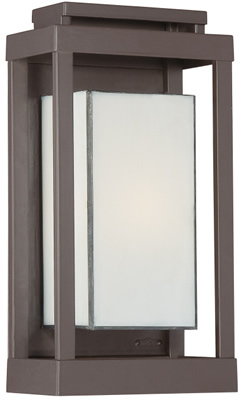 Standard: 60W T10 Medium-based 120V incandescent, lamp not included. 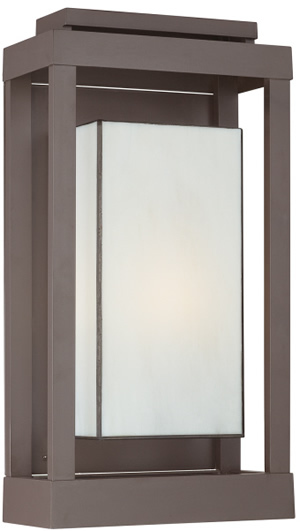 Dimmable with standard incandescent dimmer (not included). 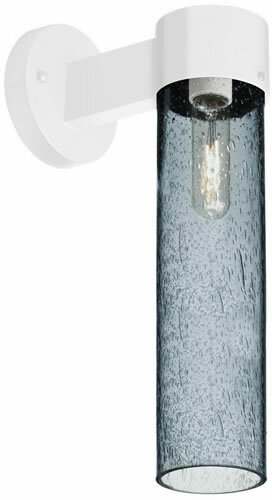 Edison: 40W Edison Filament Medium-based, 120V, lamp included. lumens, 25,000 hours, lamp included. 2200°K CCT, 540 lumens, 15,000 hours, lamp included. 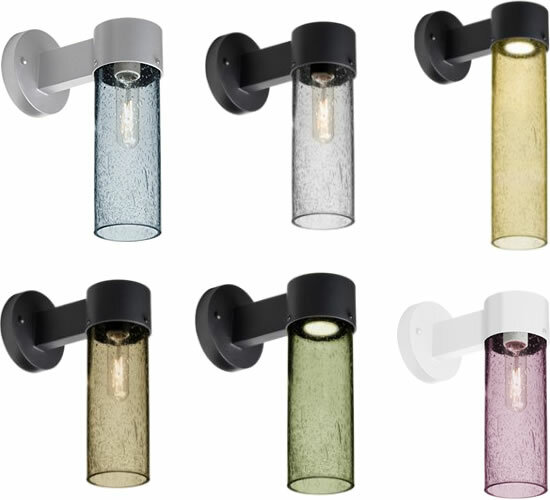 The Juni 10 sconce is composed of a black aluminum bracket and a transparent Blue, Clear, Gold, Latte, Moss or Plum glass cylinder, with an interesting bubble pattern blown randomly throughout the glass. The pleasing play of light through the bubble accents make for a striking affect. 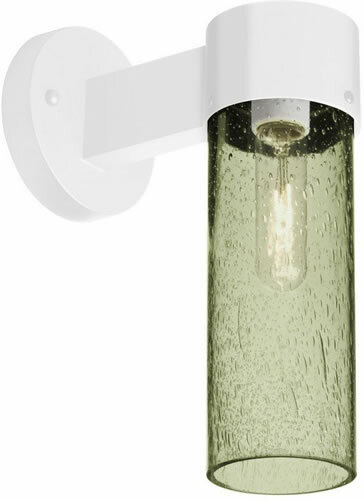 The standard incandescent option offers a prominent display of the lamp filament behind the glass, while the LED option results in a splash of concealed LED downlight. 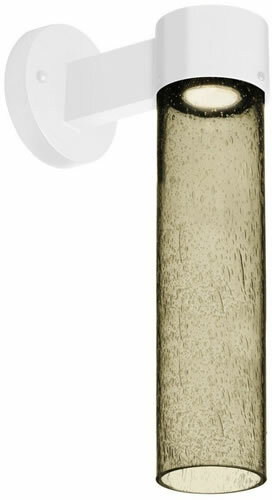 Suitable for Wet Locations (interior or exterior use). 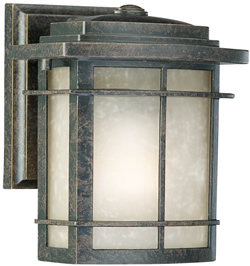 Dimensions: 7 1/2" Height x 6 1/2" W, 6" Ext. 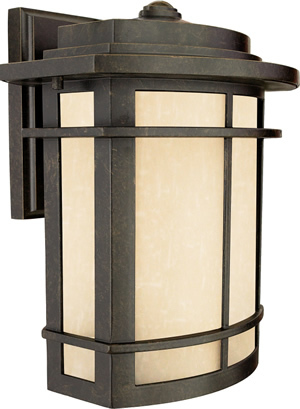 Shade: 5" x 6" x 3 1/2"
A design made for classic Arts & Crafts style homes, but looks great on contemporary or modern homes as well. 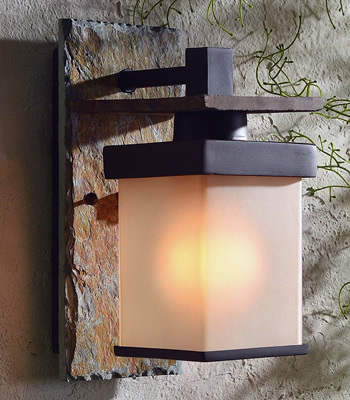 The imperial Bronze finish will coordinate well and the umber linen glass is the perfect light source for your outdoor décor. 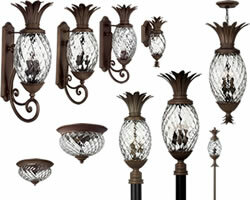 This collection, with its classic elements, will bring understated flair to any home. Dimensions: 10" Height x 8 1/2" W, 7 1/2" Ext. Shade: 6 1/2" x 8" x 4"
Dimensions: 12" Height x 10" W, 8 1/2" Ext. 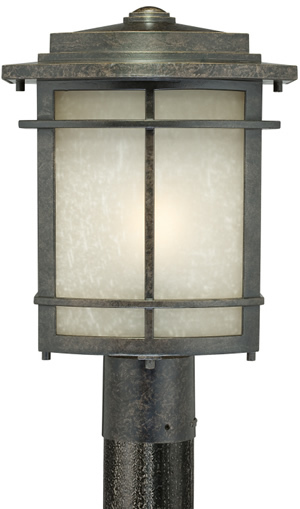 Shade: 7 1/2" x 9 1/2" x 5"
H 20.5" x W 7" x D 3.75"
Indoor/outdoor LED sconce of individually cast Moonlit Mist clear glass pillow-shaped pieces, fused at high temperature in a hand-laid cobblestone pattern. The sole lenses create a fascinating light diffuser & sculptural form. Exposed metal in hand-applied silver finish. Dimensions: 13 1/2" Height x 7" W, 5" Ext. Shade: 4 1/2" x 8 1/2" x 3 1/2"
Dimensions: 17" Height x 9" W, 5 1/2" Ext. 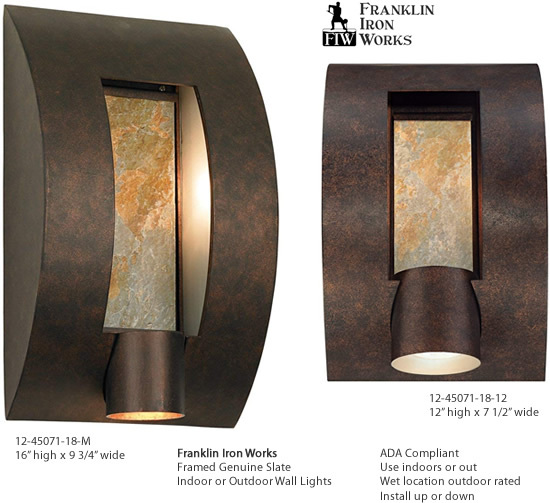 Shade: 5 1/2" x 10 1/2" x 4"
Shade: 5 1/2" x 11 1/2" x 4"
Dimensions: 20 1/2" Height x 11" W, 6 1/2" Ext. 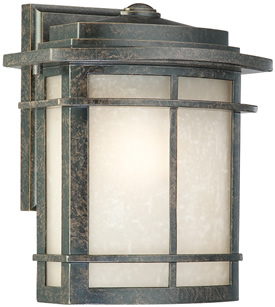 Shade: 7" x 13" x 4 1/2"
Freeport features a classic New England design in cast aluminum construction complemented by clear or etched seedy glass for a timeless traditional style that will complement a variety of exteriors. 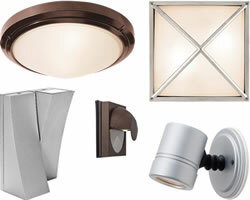 Choose LED or Incandescent. 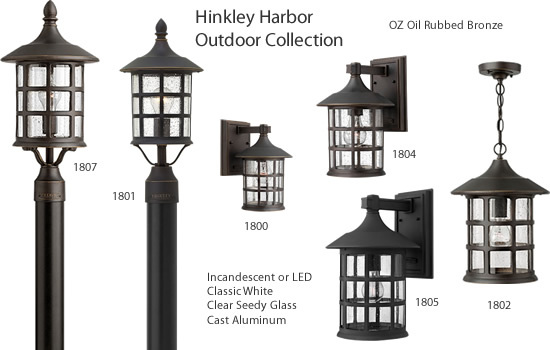 Available in Black, Classic White or Oil Rubbed Bronze with Clear Seedy Glass or Olde Penny with white Etched Seedy Glass.